Christine Kane is a pastel and watercolor artist who is inspired by the Midwest landscape and it’s seasons. 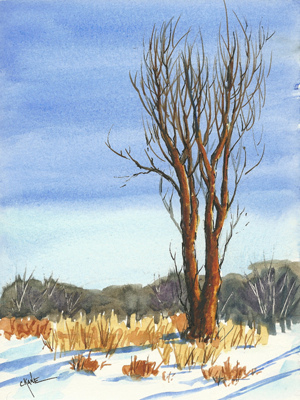 To find new ideas for her paintings, she hikes in the forest preserves during all seasons. Christine began drawing at an early age. She focused her education on art and has a degree in Graphic Design. She is continuing her studies and is currently pursuing a degree in Natural Resources. Christine finds God’s handwork in all aspects of nature and tries to translate her awe and reverence in her artwork. Never disappointed, she relies on His creation for inspiration. This is a picture I took about two years ago at Spears Woods. 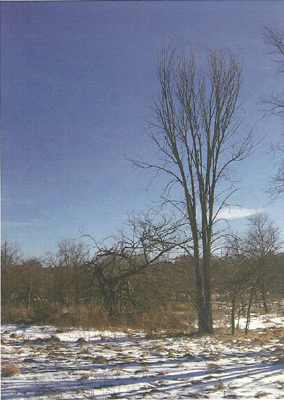 I’m not 100% sure this is a poplar tree, but I love its shape. It’s super tall and it’s the only one like it around. One interesting thing I learned is that all planted poplar trees are male, so they do not reproduce. That may explain why it’s the only one. For artistic purposes, I’m going to refer to this as a poplar. Someday in the summer, I will go back with my tree book and confirm its identification. Step 1: This is a cold press watercolor block 6×9. Using a #2 pencil, lightly sketch out a road map. 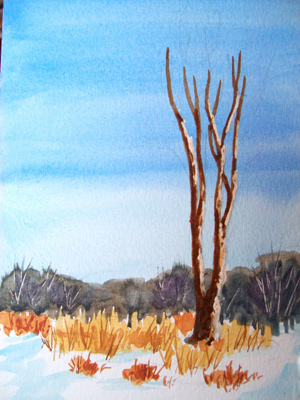 Place some masking fluid on the right side of the tree where the sunlight will be highlighted on the trunk. Let dry. 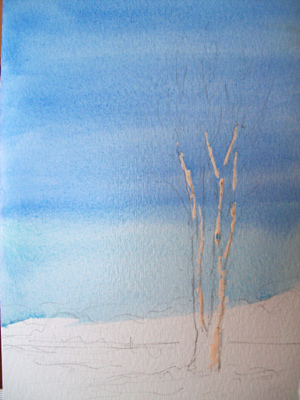 Step 2: Wet the sky using a 1″ flat brush and clean water. While the sky is still wet but not shiny wet, paint the top of the sky cobalt blue, working your way down in rows. When you get more than half way down, paint the sky a cerulean blue. This is called a watercolor wash. 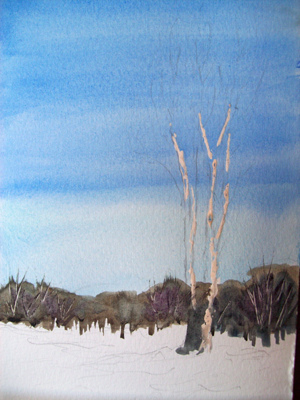 Step 3: In the back, paint the distant trees using a mixture of cobalt blue and burnt umber. By the horizon where the trees touch the ground, paint that area rough, going up and down. This is where our grasses will begin. Leave room for them. Here and there in the background trees I also painted a few blobs of purple by mixing cobalt blue and alizarin crimson. While this is wet, use a sharp edge and scrape out some tree trunks. Step 4: In the mid-ground make some dried grass shapes (just blobs). I used yellow ochre and burnt sienna. Step 5: When everything is dry, take a rigger brush and make some blades of grass on top of your grass blobs. The blades of grass should be a shade darker than your grass blobs. Next use some cerulean blue and paint some snow in the foreground, but don’t cover everything, let some white paper show through. Tip: Remember with watercolors it’s always lightest color first then overlap with darker colors last. 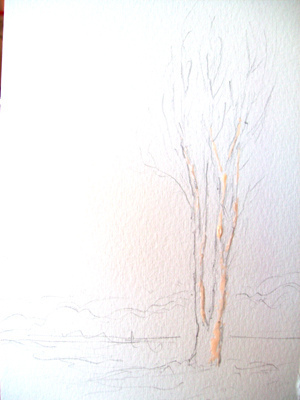 Step 6: Using burnt umber and a small round brush, paint the trunk and a few branches. remember to stay to the left of the making fluid…the sun will be on the right. Step 7: Use a rigger brush to make thin branches on top. 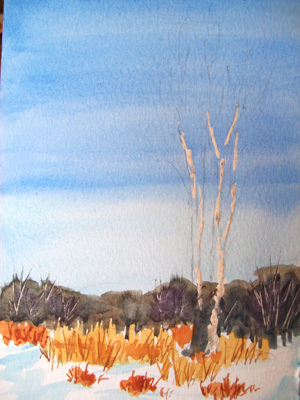 Some branches are burnt umber and some have cobalt blue mixed in to appear darker. Stay true to the shape of the poplar with long sweeping strokes bowed slightly inward on top. Step 8 Final: Now for the yummy details! 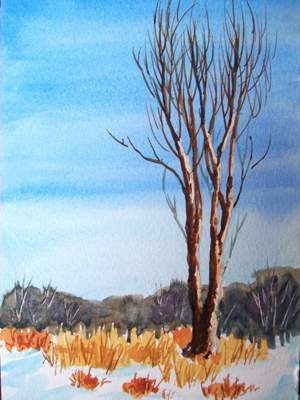 Take the masking fluid off the tree and kiss that trunk with sunlight! First I painted the sunlight with pure orange, when still wet tough the orange with some burnt sienna. Golden goodness. 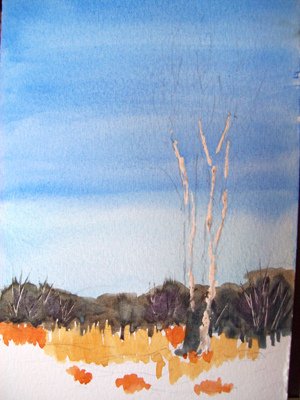 Next, with cobalt blue and the side of a 1″ flat brush, paint those terrific shadows across the ground. Finally, take a micron pen and make smaller branches and outline the trunk (optional). I think you will be really surprised at how not difficult this painting is, if you try it for yourself. Go ahead…you can do it! Painting is like keeping a piece of nature all for yourself. Another way to have a little piece of nature is by checking out local Chicago artist, Jim Milkowski’s, Wolflake Creation – wooden treasures. I personally have a birch pencil holder (with woodpecker holes and lichen!!!!) and I LOVE it! I also have a few polished crosses that have wonderful variegated wood grains. Check out his Etsy shop!